Supplied to Simon Harcourt, 1st Viscount Harcourt (d. 1727) for Harcourt House, Cavendish Square, London. Simon Marks, 1st Lord Marks of Broughton (d. 1964) and by descent. This Harcourt House armchair was commissioned in the mid-l720s for his London home by Simon, 1st Viscount Harcourt of Stanton Harcourt, Oxfordshire, formerly Lord Chancellor to Queen Anne. His Cavendish Square house was designed by the Rome-trained gentleman/architect Thomas Archer (d. 1743), and furnished in part by the court cabinet-maker and upholsterer, James Moore (d. 1726), whose advice in the Blenheim Palace furnishings had earned him praise as Sarah, Duchess of Marlborough's 'oracle'. It is likely to have formed part of a set of eight 'state apartment' armchairs, designed in keeping with Archer's baroque architecture, and may have been intended to be upholstered in (21" width) Spitalfields velvet patterned with Roman acanthus, such as was adopted in the early 1720s for gessoed chairs supplied for Erddig, Wales (see G. Beard, Upholsterers and Interior Furnishing in England 1530-1840, London, 1997, p. 178, fig. 160). 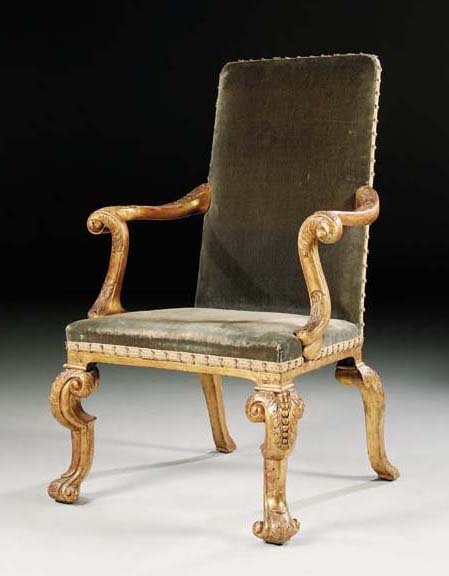 The armchair, with its serpentined cabriole legs and acanthus-wrapped volutes, also corresponds to 'Louis Quatorze' chair patterns illustrated in the Second Livre d'Appartements, c. 1700 issued by Daniel Marot (d. 1752), 'architect' to William III, and reissued in his Oeuvres, 1712. While its arm-supports, of voluted trusses after the Inigo Jones 'Roman' fashion, can also be found on a 'Modern' style armchair advertised by the Soho cabinet-maker John Hodson in his 1727 trade-sheet (see Sir A. Heal, The London Furniture Makers, London, l953, p. 80). This chair is likely to have been among the items invoiced by James Moore in l724 (The Dictionary of English Furniture Makers 1660-1840, Leeds, 1986, p. 619). Another pair of this set, although with varied acanthus carving, is now at St. George's Church, Hanover Square, London, and was probably presented by William Edward Harcourt, 2nd Viscount Harcourt (d. 1979). Another chair was sold by Mrs. Constance Levy, Cote House, Oxfordshire, Christie's South Kensington house sale, 19 September 1977, lot 53.